Alexandria, VA, March 18, 2016 – Rubenstein Partners, L.P. (including its affiliates, “Rubenstein”) is announcing that it has completed the formation of the team for the rebranding and repositioning of Carlyle Tower located at 2461 Eisenhower Avenue, a 14-story mixed-use office and retail property in Alexandria, VA. Shortly after acquisition, Rubenstein entered into a joint venture with Northpoint Realty Partners (“Northpoint”) and then engaged Newmark Grubb Knight Frank for the office leasing and Rosenthal Partners for the retail leasing. EagleBank has provided financing to implement the redevelopment program that has been designed by Nortitake Associates. Rubenstein acquired the 365,000 square-foot mixed-use property, located across the street from the National Science Foundation’s new headquarters and the Eisenhower Avenue Station Metro in the Carlyle District of Alexandria, at the end of last year. The property includes a 335,000 square-foot office building with first floor retail along with a 32,500 square-foot single-story retail center and to-be-built retail pad site that “wraps” the office building and contains multiple restaurants. The building includes views of the Potomac River and offers direct access to I-495 and I-95 with tenant building signage opportunities that can be viewed by over 200,000 cars per day. Rubenstein and Northpoint have embarked on a complete renovation to transform the property into a brand new Class “A” office building with new skin, systems, lobby, fitness, conference and related tenant improvements, in addition to the existing retail amenities. 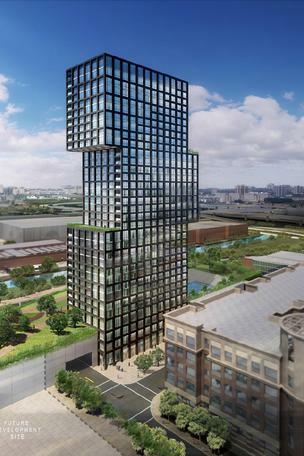 “Carlyle Tower is planned to be state-of-the-art in terms of physical building improvements and mixed-use Metro proximate amenities, “ says Steve Evans with Rubenstein. The City of Alexandria and its Ad Hoc Pedestrian and Bicycle Master Plan Advisory Committee have recently completed a draft Pedestrian and Bicycle Master Plan and are seeking public comment through February 5, 2016. An easy way to comment is to take the Community Survey available athttps://engage.alexandriava.gov/portals/191/Forum_537/Issue_3314/survey_responses/new. If you would like to review the entire draft plan, here is a link to a pdf of the plan document: http://alexandriava.gov/uploadedFiles/tes/info/Alexandria%20Ped%20Bike%20Master%20Plan%20DRAFT%202%20-%20Full%20Text(1).pdf. The updated draft plan reflecting public input will be reviewed by the City's Transportation Commission, Planning Commission, and City Council in the spring, to be adopted as a Chapter of the Transportation Master Plan. Although the Plan is citywide, several improvements are planned in the Eisenhower Avenue corridor. Zipcar is Free to join for Alexandria Residents and Businesses !! Zipcar and City of Alexandria have put together a special program for residents. Join Zipcar and City of Alexandria will refund your application fee and your first year's annual membership fee. There are Zipcar locations on Ballenger Avenue and by Eisenhower Metro station. This program is only available to Alexandria, VA residents and businesses. Cannot be used with other offers of discounts. Next January, PBS will broadcast a new historical series on public television called "Mercy Street." This will be the first time in over a decade that a PBS dramatic series has been produced in the United States - and the story takes place in Alexandria in the Spring of 1862 and centers on health care and hospitals! It has been described by the producers as "E.R. for the Civil War," and is expected to be the "next Downton Abbey." Mercy Street follows the lives of two volunteer nurses on opposite sides of the Civil War conflict. One is a staunch New England abolitionist. The other is a naive young Confederate "belle." The two confront each other in Alexandria, Virginia, a Confederate-occupied city located just across the Potomac River from Washington D.C., the North's seat of power. The Alexandria Film Festival will host the premier screening of Mercy Street with a full episode of the series on November 5, 2015, the first day of the Festival. Sponsors for the festival which is scheduled for November 5 through 8, 2015 are needed. PBS, of course, will be heavily promoting the Mercy Street program starting this fall and this would be an opportunity to associate yourself with the film -- and at the same time help the AFF, now in its 9th year. Some of the events this year will be exclusive to sponsors and other VIPs and will not be open to the general public. We're deep into reviewing films submitted to the festival from around the world and are now developing the exhibition program. Attached is a brochure describing the various levels of film festival sponsorships. Please note that Alexandria Film Festival has an official 501(c) 3 status which means that sponsorship contributions are tax deductible.